Whisk, pour and swirl! 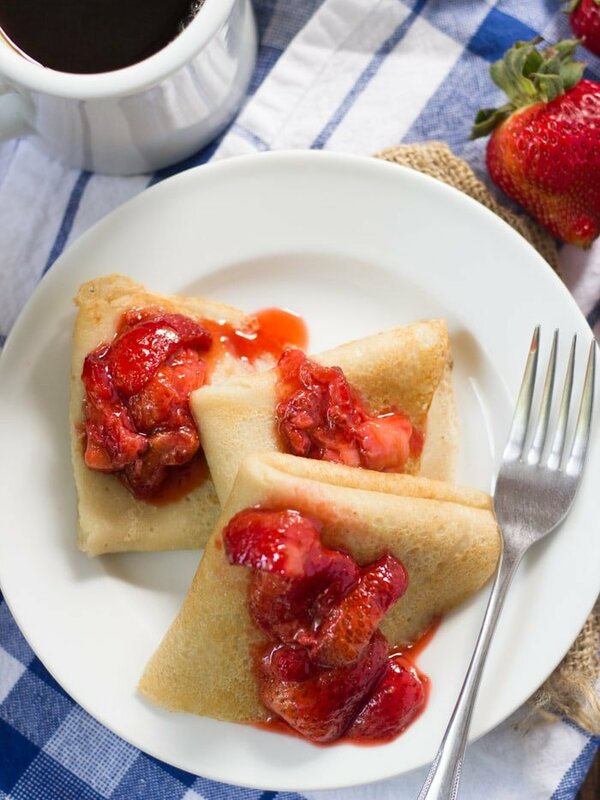 These vegan crepes are super easy to make, and can be eaten as part of a sweet breakfast or stuffed with savory fillings for an elegant dinner. I know, fancy, right? Yes but no. Crepes seem pretty fancy and all, almost like extra fancy pancakes, but in a way, they’re actually kind of like extra lazy pancakes. Let me explain. When I was a kid, my brother started spending time at the neighbor’s house, and soon thereafter began requesting crepes from mom. Neighbor’s grandma made crepes. Of course, I think mom was a little annoyed by all this. Who has time for fancy-pants crepes? It wasn’t until I started taking cooking classes in high school that I realized everyone has time. It takes like, a minute to make a crepe. A pancake takes 4 minutes, on a good day. It’s all about technique, but once you’ve got that down, super easy. And crepe batter is pretty much thinned down pancake batter. Pretty soon I got into the regular practice of thinning down our weekend breakfast pancake batter and crepe-ing away. I’ve made a lot of crepes over the years, and I think I’ve finally perfected my recipe for vegan crepes, so here it is. Super simple, pretty darn easy and totally delicious. These crepes are super freezer friendly! 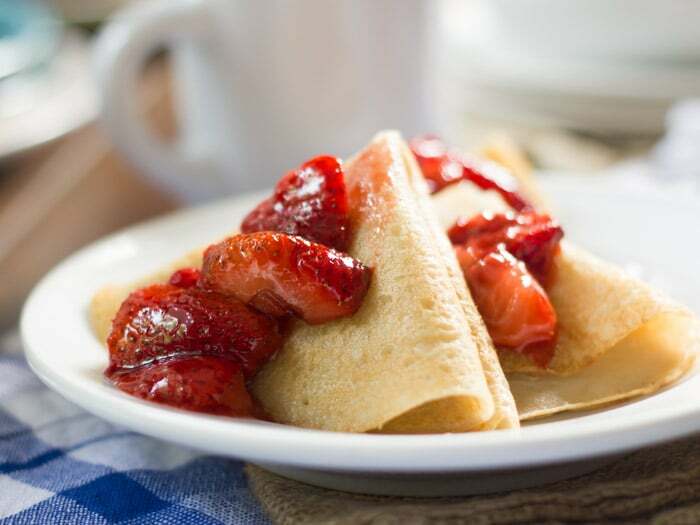 To freeze, just stack 5 or 6 crepes with sheets of parchment paper in between them. Place the stack in a freezer bag and freeze. For savory crepes, omit the maple syrup and vanilla. Getting the batter to the right consistency is essential to perfect crepes! If it’s too thick and/or not spreading out quickly when you swirl the pan, add some water. If it’s too runny, whisk in a little extra flour. Does the batter absolutely need to be refrigerated? Nope! If you don’t have time, you can skip this step. If you do have time, it’ll give the gluten a chance to relax and improve the texture of your crepes. Place all ingredients except water into a medium mixing bowl and whisk together until completely smooth. Start with a test crepe. Very lightly oil the surface of a nonstick frying pan and place over medium heat. When the pan is hot, add about 1/4 cup of batter and quickly swirl it around until the entire bottom surface of the pan is coated and batter takes on a generally circular shape. Cook just until the edges start to pull away from the bottom of the pan, about a minute. Very carefully flip and cook 10-15 seconds more on other side. Slide the crepe out of the pan and onto a plate. Adjust the batter as needed. If it seemed too thick and was difficult to swirl, whisk in a few splashes of water. Repeat until all batter is used up, adjusting by adding more water as needed. Lightly reoil the pan as needed between crepes. Serve with your favorite sweet or savory fillings. Recipe for roasted strawberries (pictured) here. Practice makes perfect. I always find that as I make adjustments and get into a groove, my crepes get better. The last few of the batch tend to be the best. If you're a crepe newbie, consider doubling the batch size to account for goof-ups. If you'd like a bit more guidance on how to make a perfect crepe, this is a great tutorial. I made these tonight and filled them with leftovers. Hubby loved them and did not seem to notice he was eating the same thing as the day before! ;) Question–can the batter sit in the fridge overnight before cooking, or must it sit in the fridge for only an hour? nice recipe, i like that. Did you make sure you were using a nonstick pan? The only other suggestion I could make is to use cooking spray instead of oil – it can sometimes coat more evenly than just oiling the pan. These are awesome! I made them earlier and ate them all!!!! I feel so ill now, but I regret nothing! Haha! Glad to hear it!! Just made these for breakfast with fresh strawberries and kiwis. Yummy! Thanks! Glad you enjoyed them! Thanks Carmen! These came out great! Thanks for sharing! Making them for dinner tonight. Thank you! I was wondering if these would freeze well between layers of waxed paper?? Thanks. So what’s the water for in the recipe? You don’t state what to do with the 1/3 cup water after you refrigerate the batter. Oops. I figured out the water. Silly me. Another question, is it necessary to refrigerate the batter before cooking? What would happen if you don’t chill the batter? You can skip it, but they’ll probably have a nicer consistency and be a bit thinner if you let the batter rest so air bubbles can escape and the gluten can relax. These are just as good as crepes with eggs in them. This will be my go-to recipe from now on! That’s Awseome to hear! Thanks Al! WOW, these are fan-freakin’-tastic!. 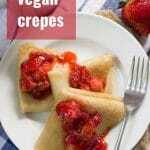 I’ve been vegan for about 4 years, but recently have been getting into baking.. We just got back from France so I wanted to find a vegan crepe recipe. I added vanilla, but NOT maple syrup. The first crepe I stuffed with spinach, mushrooms, onions and Gardein meatballs.. The second one, I used organic peanut butter and vegan chocolate syrup.. with powdered sugar.. as the previous poster stated.. I regret nothing. On thing, my batter did come up a bit lumpy.. not sure why I used the whisk until my arm nearly fell off.. but it cooked up without lumps..Also, I couldn’t flip them with the knife, but I found the slide out of the non-stick pan.. so I flip them by hand. Yay!! I’m glad you enjoyed them! Both sweet and savory fillings sound delicious! Thanks Thyra! Yes you can! I’ve done it, and it works great if you stack them with sheets of parchment paper in between and then slide the stacks into freezer bags. Do I have to leave it in the fridge for an hr before cooking? You can skip it if needed, although it does improve the batter’s consistency. outstanding- tasted delicious. I needed the full 1/4 cup water to get the correct consistency. We omitted the syrup and vanilla since we were making savory crepes. Will be my go-to recipe! Yay!! Glad you enjoyed them! This was such a yumny recipe! 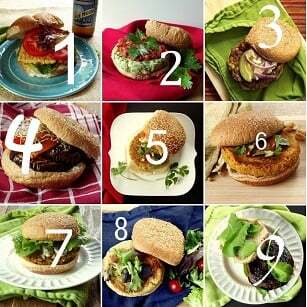 I have been vegetarian for 6 years and have decided to take the final leap and go vegan! 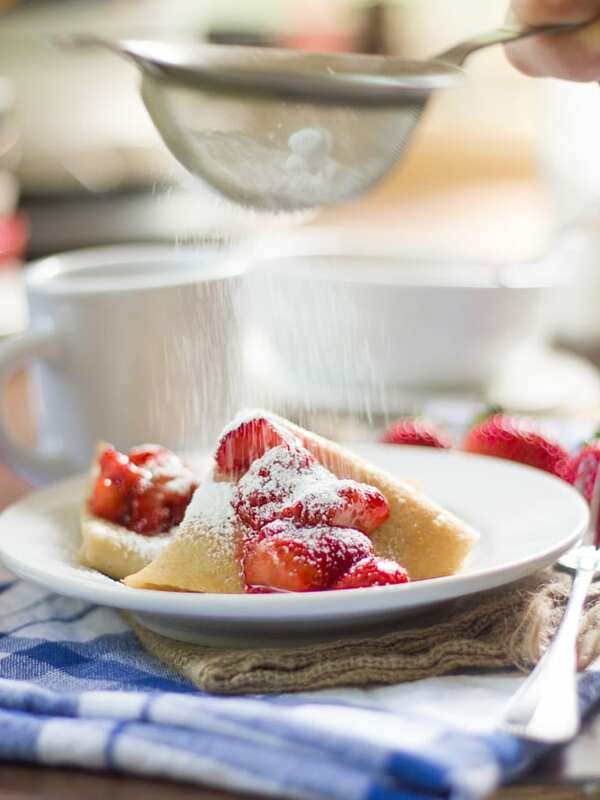 I love to cook and bake and these crepes were a definite hit for sweet and savory fillings. Thanks! Awesome!! I’m so glad you enjoyed it! Thanks Jasmine! Nice recipe but scant. No way would I ever get a dozen crepes – I got 5 including the test crepe in a 9.5 inch diameter skillet. Next time I’ll double it. Filled them with a banana cream. Hmmm…that’s strange! Were you measuring out the batter before putting it into the skillet? You should only need 1/4 cup per crepe. If that’s not enough to coat the bottom of your pan it might be too thick – add a splash of water. Banana cream sounds like a delicious filling for these! Is it possible to substitute gluten-free flour for normal flour and still have the crêpes come out well? Thanks! I’m not sure! I know there are recipes out there that use chickpea flour, but I’m not sure if that would work with this one. These are legit the best crepes. We love crepes and I don’t even miss the traditional egg-based crepes with this recipe. Yay!! I’m so glad you think so! Thanks Heidi! Crepes are an essential part of Russian cousine so I really missed them when I went Vegan because I couldn’t seem to replicate them without eggs. But these… mmm…These are the best I’ve ever had – vegan or not. They are so delicate and smooth, and I didn’t even have to refrigerate them! That is awesome! I’m so glad you enjoyed these! Thanks Lisa!